The 3rd Division advances and in spite of the dykes, continues to drive the enemy back. The town of Estaire is occupied by French cavalry who immediately turn it over to British troops. At first light the advance on Yabassi is resumed, and after some desultory fighting in the bush, the Germans completely withdraw, leaving the British to occupy the town. The campaign against Yabassi has cost the life of one officer, three British NCOs, a few blue jackets, and some forty native soldiers. 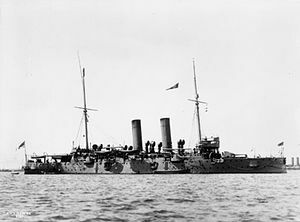 The Edgar Class cruiser HMS Hawke (Captain Hugh Powell Evan Tudor Williams) is torpedoed and sunk by U9 with the loss of 524 men (only seventy survive). U9 was also responsible for the sinking of the cruisers HMS Aboukir, HMS Cressy and HMS Hogue last month. Captain Williams a holder of the Royal Humane Society’s Medal for Life Savings dies at age 40. Surgeon James Henry Digby Watson CB an English International Rugby player killed at age 24. He also played Rugby for Blackheath and London Hospital and was also the Edinburgh University Middleweight Boxing Champion and he represented Scotland versus Ireland in the Long Jung in 1912 which he won. The Paymaster on the Hawke is Alan Murray Austin who dies at age 30. He is the son of Francis Murray Austin, the sometime Archdeacon of Georgetown, Demerara, British Guiana. Midshipman Harry Escombe Ravenhill Jerramis also killed when the ship is sunk. He is the son of the Reverend Arnold Jerram. Petty Officer David Hookham is killed at age 38. His brother will be killed in the sinking of HMS Hampshire in June 1916. Ordinary Seaman Ernest Edward Corder is killed at age 18. His brother will be killed in action in April 1918. Stoker Frederick George Ralph is killed at age 34. His brother will be killed next May. Many of the survivors are picked up by the destroyer Swift, the steamer Modesta and the trawler Ben Rinnes including Chief Gunner James Dennis, who will be killed in July 1917 in the explosion of HMS Vanguard. Lieutenant Richard Christopher Gorges Foote (Royal Marine Light Infantry) dies of wounds received nine days earlier at Antwerp at age 20. He is the son of the Reverend John Vicars Foote. Private Robert MacDonald (Seaforth Highlanders) dies of wounds received at Hazebrouck. His brother will be killed in July 1916.